My stomach isn't what it used to be. I used to actually look forward to taking gels on my run. I mean, they tasted like frosting and I needed it because I'm running, right? Alas, part of my tragically terrible PR attempt failure earlier this spring was what polite people refer to as "digestion issues." Those little gels were doing rather unpleasant things to my insides, which caused me to slow down considerably in the last quarter of the race, missing my PR. In planning my triumphant underdog comeback, I investigated and tried new fueling strategies. I decided to make my own running fuel so I could control the ingredients and ensure it was all real food that agrees with my system. I knew I'd need a combination of carbs, sugar and fats, and I wanted it to taste like something I would look forward to eating. As was evidenced last week at my PR-setting half marathon, I've found something that's easy to digest and gives me the boost of energy I need to cross the finish line. 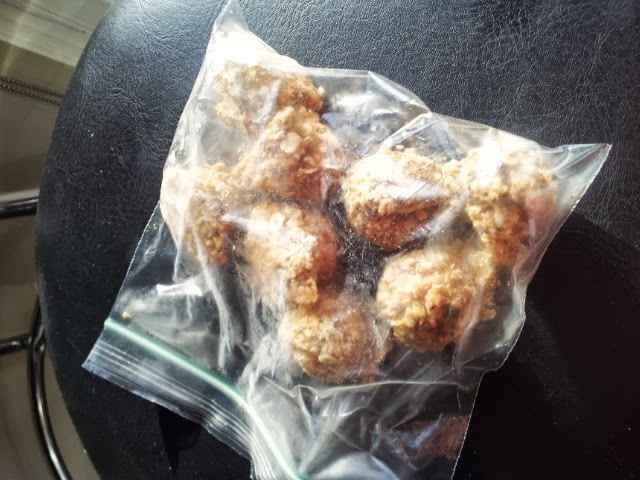 In terms of storage, I froze my fuel into half-Tablespoon size balls, then placed four into a snack-sized ziptop bag. I cut off one end of the bag and put it into my handheld water bottle so it was easy to grab a fuel ball and pop it in my mouth while running. This does require a bit of chewing, but I found it to be a welcome distraction on the trail. Mix together the dry ingredients, then set aside. Place the peanut butter, honey and coconut oil in a microwave-safe dish and heat for 30 seconds on high, then stir to combine. Use a fork to mix the dry and wet ingredients together. You may need to add an additional Tablespoon or two of water to get it all mixing together. I used a round 1/2 Tablespoon measuring scoop to portion these out and then froze them overnight. I ate one at mile four and nine of my last half marathon and went for a PR, but you'll want to try these out before race day to make sure everything works for you. 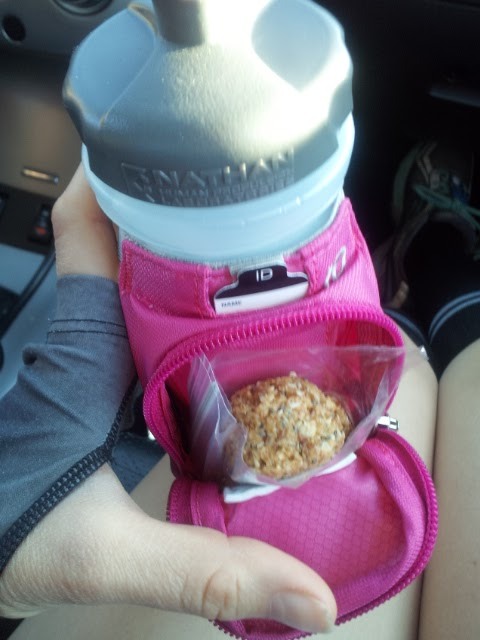 I'm not a big snacker for distances, but this looks like a great snack for the day to cals for the day! I've made something similar before - I think I found it on Pinterest and I modified the recipe based on what I had on hand. It was OK but I think too heavy on the honey. I'll have to try this recipe sometime! I might also just try my own trail mix. Kind of makes sense, right? Haha. Anyway, thinking of just mixing pretzels, dried fruit and nuts. what a great idea! 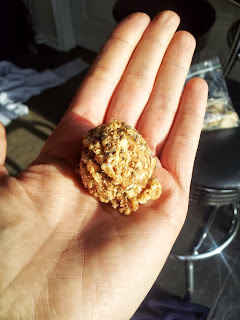 do you have a homemade granola recipe? I don't think I could eat these while running (dried fruit and I don't get along during physical activity) but these would make awesome snacks otherwise! 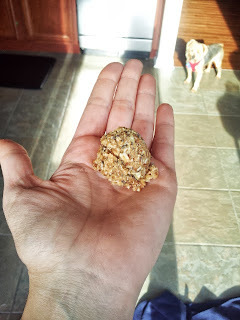 I made a batch without raisins and it was also quite delicious. Thanks for posting this! I bookmarked it and plan on trying it out asap. Hope you're having a great time in California! Looking forward to trying these Kelly! !